Zephyr Teachout and Tim Wu’s bid against New York Governor Andrew Cuomo: A challenge from the left. Progressives Zephyr Teachout and Tim Wu are on a mission to push the New York governor’s race to the left. 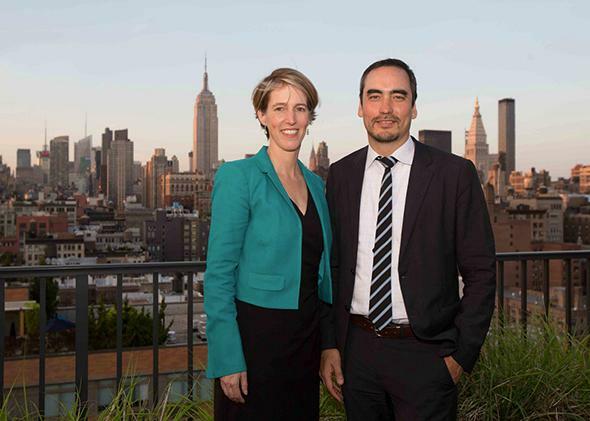 Zephyr Teachout and Tim Wu are challenging Gov. Andrew Cuomo from the left. NEW YORK—The Staten Island Democratic Association meets every month at Karl’s Klipper, a seafood joint just a few blocks from the ferry, where the management is thoughtful enough to provide presidential-themed placemats. Tonight’s meeting will start early because a candidate for governor—someone named Zephyr Teachout—has to be right in and right out. “This is the guy running against the governor?” asks Marie Dwyer, the association’s secretary. “Zephyr, you know, it sounds like one of those names the hippies gave out in the ’70s,” says a retiree, poking through his tuna melt. Wrong, and—well, not wrong, although a glance at the candidate essay and photo provided at the meeting could have solved the gender conundrum. When Teachout arrives, clad in a yellow business suit and trailed by one aide, she works the room and apologizes for her roughened vocal chords. “I’ll speak for five or 10 minutes and take your questions,” she says. The bar blares ’90s radio rock. An errant radio is playing the All-Star game. Teachout rolls with it. Still, some of her lines are greeted with polite, blank looks. Then she starts talking about how to do that—education spending, more rails, a better MTA, a ban on fracking, a gay and transgender rights bill. The chatter slows, then stops. Teachout has the room. Teachout is Gov. Andrew Cuomo’s avowedly progressive primary challenger, in a year when few Democrats are sweating the left flank. No red state Democratic senator—not even the ones who broke with the party on immigration or gun safety—drew a 2014 primary challenger. No Democrat is seriously organizing to challenge Hillary Clinton’s expected presidential bid. Cuomo, who dismisses Teachout as an avatar for the “extreme left,” has raised $35 million for his re-election bid. Teachout has raised $277,360. But she’s running, and she’s running avowedly to force Cuomo to the left. Teachout was the director of Internet organizing for Howard Dean’s 2004 presidential bid, the great lost cause that adopted then empowered the liberal “netroots.” Dean’s campaign changed the boundaries of the debate in the Democratic Party. The 2006 primary defeat of Sen. Joe Lieberman cemented those changes. But there’s been no great shift since then, and Teachout frames the New York race as a guilt-free, risk-free chance to move the party left. The story of “Andrew Cuomo, closet right-winger” is well-known among progressives and obscure for everybody else. Cuomo won an easy 2010 race against one of the year’s most self-destructive Tea Party candidates, and when he’s made national news, he’s done it by driving left. He signed gay marriage into law. He signed a gun safety bill. He warned “extreme conservatives” not to waste their time in New York, which made him a dunk-tank villain on Fox News. Polls give the governor supermajority support from self-identified Democrats. Progressives, Teachout especially, didn’t think the other Cuomo story was getting told. Cuomo had spent his tenure working with a Republican state Senate—in marked contrast to former Democratic Gov. Eliot Spitzer—and giving school boards less than they asked for while proposing property and estate tax cuts. After his lieutenant governor bowed out, he chose former Rep. Kathy Hochul as a running mate—Hochul, who had won a tough western New York district by running to the center, Hochul who even took credit for quashing a bill that would have given driver’s licenses to undocumented immigrants. That tore it. The Hochul choice was enough to get Tim Wu, the net neutrality advocate and legal theorist (and sometime Slate contributor), to join Teachout on her ticket. So far, it’s almost working—and ironically, that may be due to an early setback for the progressives. Teachout entered the race days before the Working Families Party convention, where activists would determine the progressive third party’s ballot line. She’d been approached to run months earlier, at a time when polls suggested that a WFP candidate could pull a quarter of the vote. All of it would come from Cuomo’s left. Any of it would cost Cuomo him his expected landslide. Too much of it would elect a Republican governor. The progressives were cut off at the pass. Cuomo scrambled, cutting a video to court the WFP endorsement, then cutting another to make sure the details were right. The governor who’d already been making election-year deals with labor unions made specific concessions to the left. Deny Teachout the WFP line, and he’d try to elect a Democratic Senate. Once he had that Senate, he’d get their way on a New York version of the DREAM Act, on marijuana decriminalization, and on public matching funds for state campaigns. It worked. Cuomo won the nomination with close to 60 percent of the vote. But that removed any threat that a Teachout and Wu ticket could spoil the Democrats. Since she’s not running in the fall, since she’s only now primarying Cuomo among Democrats, Teachout is instead copping a move from the Tea Party. Conservatives stayed inside the Republican Party to force it further right, and Teachout watched it with a combination of dread and jealousy. The left-wing Tea Party never happened. Occupy Wall Street happened, and Teachout spent time with New York activists, encouraging them to focus on “Madison’s idea of decentralized power.” The internal Democratic Party policing just never happened. Even in Chicago, where one possible progressive challenger to Mayor Rahm Emanuel led him by 22 points, the establishment scared her off with a tower of campaign money. Teachout will be outspent, too. Whoever was going to run against Cuomo was going to be outspent. In Staten Island, she ends her pitch with a real-life allegory about her family’s Vermont farm, an idyllic place roamed by cows and chickens, and then, eventually, a bull. “We weren’t ready for the bull,” says Teachout. Teachout pauses and grins wide.